Formerly "Picture of the Month"
The "ghosts" to which Pirsig refers at the end of this short extract are the ghosts of rationality, rationalities that we construct ourselves in our minds by the way we conceive of the "systems" that surround us – not only those worked out in steel but also the institutions and governance systems by which we run our societies. The rationality of systems lies in the minds of those who design and control them. Due to the subjective and often self-serving nature of such rationalities, they risk leading us away from true knowledge and understanding and thus also from true rationality and improvement of practice. This kind of alienation of prevalent notions of rationality from people's experience and needs is what ordinary citizens mean when they refer to the responsible instances and administrative structures of their societies as "the system" – the impoverished constructions of rationality they see embodied in these instances and structures and which are not really connected with their own experiences, needs, and hopes, yet shape their everyday reality. "The true system," as Pirsig (1975, p. 94) puts it in the motto cited at the outset, "is our present construction of systematic thought itself, rationality itself." The reference systems of which we speak in boundary critique are ideal-typical reconstructions of such rationality perspectives. They are "ideal-typical" in that they hardly ever occur empirically in pure form; rather, they shape real-world practice in constantly changing combinations and situational adaptations. They can help us understand the rationality perspectives that inform claims to relevant knowledge and rational action. In what ways are such claims selective as to the facts and values they consider relevant, and partial as to the parties that are likely to benefit? Critical systems thinking Systems thinking has long assumed that taking a "systems approach" – conceiving of situations or issues in terms of relevant whole systems, with a consequent effort of "sweeping in" a broad range of circumstances and considerations (Singer, 1957; Churchman, 1968, 1982) – can help us avoid such selectivity and partiality and thus can secure a higher degree of rationality than conventional analytical thinking can. In practice though, the quest for comprehensiveness is bound to fail inasmuch as it finds no natural limit. It is a meaningful effort but not an arguable claim. Accordingly, the sweep-in principle cannot resolve or avoid the problem of the inevitable selectivity and partiality of all practical claims to relevant knowledge, rational action, and resulting improvement. Rationality and selectivity are inseparable siblings, regardless of whether we take a systems approach or not. This is why in my work on critical systems heuristics (CSH),1) the principle of boundary critique – the requirement of promoting a reflecting and transparent employment of the boundary judgments that are constitutive of our reference systems – had ultimately to replace Singer and Churchman's sweep-in principle as a methodological core principle of systemic thought and practice (Ulrich, 2004, p. 1128). Rationality and reference systems Critical systems thinking begins when we first realize that our reference systems of thought and action (S) do not usually comprise all the aspects of the universe (U) that might conceivably be relevant and on which our claims may consequently depend (Fig. 1). U = universe; S = current reference system of thought and action. Critical systems thinking begins when we realize that our reference systems (S) for judging situations and for assessing related claims may (and as a rule, do) not comprise all the aspects (or conditions, circumstances) of the universe (U) that would allow conclusive arguments to systemic rationality. We may refer to the unknown section of the universe that in a specific situation or issue would allow conclusive arguments to sufficient knowledge, rational action, and resulting improvement as the "relevant whole system" (W). The difficulty is, we do not and cannot usually know W, for it represents a totality of conceivably relevant conditions or of related circumstances, concerns, and ideas and as such lies beyond the reach of empirical knowledge or, in any case, beyond what from a critical point of view we should assume to know for sure. There is, in this sense, a critical difference between S and W (Fig. 2). The proper reference system for arguing claims is not a matter of course but rather, a matter of discourse! U = universe; S = current reference system of thought and action; W = the "whole relevant system"= the totality of circumstances and concerns that in principle would allow for conclusive argumentation of related claims to knowledge, rationality, or improvement, but which in practice we can hardly ever claim to fully and securely know. We are facing an eternal dilemma of reason: the quest for considering everything possibly relevant is as unachievable in practice as it is indispensable in theory. Assuming that we can live up to it and indeed consider everything relevant leads to dogmatism (e.g., in the form of boundary judgments taken for granted); abandoning it, to uncontrolled deficits of rationality (e.g., in the form of neglected "external effects" and suboptimization). Responding to the dilemma by discarding the systems idea does not help either, for that would merely mean to accuse the messenger of causing the bad news it brings us. But the systems idea is neither the cause nor the solution of the problem, it is only the messenger. The only reasonable way out is to take the messenger seriously and choose the critical path, that is, undertake a systematic effort of dealing carefully and openly with the deficits of knowledge and rationality in question. While we cannot avoid such deficits, we can at least deal carefully with them and make an effort to lay them open to all those concerned. We can trace their sources in the assumptions of fact and value that guide us. We can analyze their actual or potential consequences, that is, the ways they may affect people. And we can then assess the claims in question in the light of these assumptions and consequences and can qualify (i.e., specify and limit) their meaning and validity accordingly. That is what critical systems thinking and its central methodological principle of boundary critique are all about. we ever have sufficient knowledge of W or even U to fully justify our claims regarding S and E.
without also making "the system" the problem. of the whole relevant system (W)? It is with a view to making this question a focus of systematic methodological attention – in short, to "making the system the problem" – that in my work on critical systems heuristics (CSH), I have found it useful to rely on a standardized basic typology of reference systems (Ulrich, e.g., 1998 and 2017d). We may then understand such a typology as a basic conceptualization of the "critical difference" between S and W.
U – the total conceivable universe of discourse or of potentially relevant circumstances (see Ulrich, 2017d, pp. 17-28). CSH takes these four types of reference systems to embody four fundamentally different rationality perspectives, each of which is essential for a systematic practice of boundary critique and is accordingly also informing some of the boundary questions that together make of the standard checklist of boundary questions used in CSH.2) (The French word seau – whence comes the acronym S-E-A-U – means as much as bucket, pot, or pail and is thus apt to remind us of the idea that all four perspectives belong to the toolbox of boundary critique.) In what follows, I would like first to briefly explain why the four reference systems are actually needed (i.e., what is the underlying logic) and then to take a closer look at the rationality perspectives they embody (i.e., how does this logic translate into rational practice). Two related core concepts will be what I call "the missing element" in the conventional logic of systems thinking and a resulting "three-level concept of rational practice" for critical systems thinking and practice. "The Missing Element" The way I introduced the four types of reference systems in Part 1 of the previous essay (Ulrich, 2017b) was in terms of the kind of boundary judgments that shape our mental constructions of "the system" and which consequently allow us to trace the selectivity of related claims. 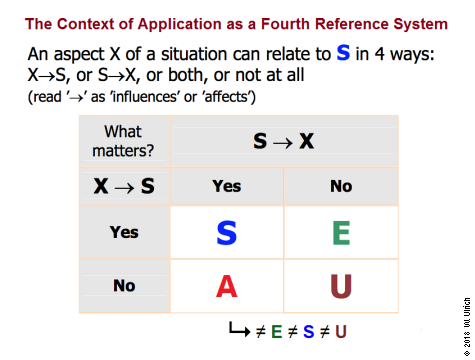 A slightly different way is to look at the criteria for what "matters" in a situation and how what matters is related to S. Four such relations are logically possible (Fig. 3). Conventional systems thinking is based on the systems / environment distinction. 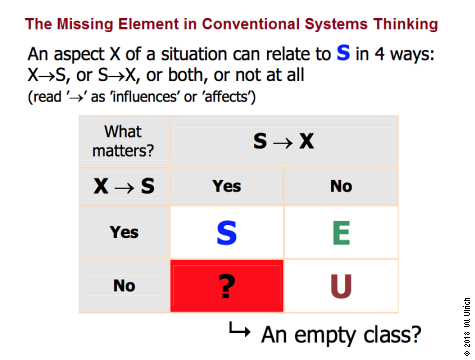 By assuming that the universe of discourse is exhausted by the reference systems S and E, such thinking leaves open the question of the nature and relevance of the "missing element" located in the red box, apart from tacitly narrowing the meaning of "relevance" to what matters to S.
Of these four relationships, three (S-E-U) can easily be understood in terms of the conventional reference systems of systems thinking, that is, the system of primary interest or concern (S), the relevant environment (E), and the remaining universe (U, also called the "irrelevant environment"). The boundary judgments that this conventional logic of systems thinking requires are (a) the delimitation of S from E (S/E) and (b) the delimitation of the environment considered relevant from that considered irrelevant (E/U). But what about the fourth relationship, the one marked by the red box in Fig. 3? In conventional systems thinking, this fourth basic relationship appears to be an empty class, as no corresponding reference system is identified and dealt with systematically, that is, as a constituent of any claim to systemic rationality. There is a gap here in the argumentation logic of conventional systems thinking that I have hardly ever found to be recognized and systematically questioned. The "context of application" This fourth relationship is what in CSH is called the "context of application" or also the "context of responsible action" or of accountability. 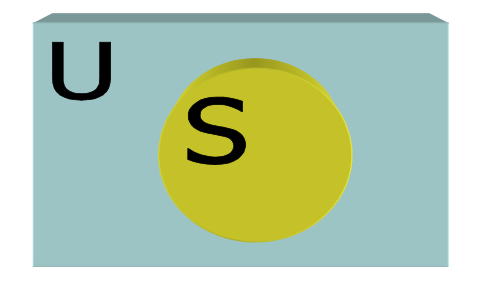 It is a mandatory part of the suggested S-E-A-U formula of boundary critique (Fig. 4); but as far as conventional systems thinking is concerned, it has remained a "missing element" in its table of reference systems. In conventional systems thinking, situational aspects or conditions that influence the system of primary interest but which cannot be controlled by it are considered "environment" in the sense that they constitute the system's relevant decision-environment (E). As they condition the outcome of systemic rationality or, in everyday terms, the system's success, there is an intrinsic interest to take the thus-understood environment into account. This is different from the context of application (A), which comprises all those situational aspects that are affected by (claims to) systemic rationality or, in everyday terms, by the system, but have no influence on it (i.e., the way rationality is defined and measured). 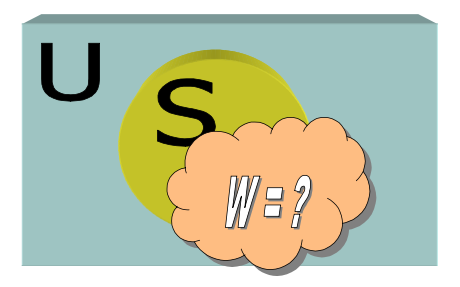 A, then, is not part of the relevant environment E of S but rather, S is environment for A. Accordingly the implications of systemic rationality for interests and concerns treated as A are often neglected or considered as "external effects" about which one cannot do much, rather than as a systematic part of all claims to rationality. The designation of A as "context of application" comes from science-theory, which conventionally distinguishes between three methodologically different tasks of research, concerning its proper handling of the contexts of discovery, of justification, and of application of scientific propositions. The aim is to narrow the relevant context for validating propositions so that the circumstances of their emergence as well as the practical applications to which they lend themselves may be considered irrelevant for their justification. In distinction to this conventional view, the point of introducing A as a reference system for judging claims is of course that in the applied disciplines, and indeed in all inquiry that may eventually be put to practical use (that is, in virtually all forms of inquiry), considering the context of application is essential for justifying claims. In fact, it makes sense to conceive of the justification of all practical claims – to relevant knowledge, rational practice, and resulting improvement – in terms of the context of application, regardless of whether their context of discovery is science or everyday experience, for the selectivity of the claims in question remains the same. Well-understood science distinguishes itself from other forms of research and practice not by being free of selectivity but rather, by laying it open. We can then define the context of application quite generally as the real-world context in which a claim's consequences, when used as a basis for action, become manifest and should be systematically examined and justified. In an age in which virtually all science sooner or later tends to become applied science and in which, conversely, ever more realms of practice are influenced by scientific research and professional expertise, the distinction between the context of justification and the context of application has indeed become obsolete. This is the more so if one considers how frequently research-based practice produces adverse external effects, cases of obvious suboptimization, and situations of "organized irresponsibility" (Beck, 1992, 1995). The implication can only be that the context of application is rapidly becoming an indispensable part of the context of justification. Yet in conventional systems thinking, as in many other fields and methodologies of inquiry, the context of application is still not systematically considered. Environment vs. context of application There is a frequent confusion in that calls for considering the "environment" are mistaken to ensure a concern for the context of application. However, in systems thinking and in the many fields that have been influenced by it, the relevant "environment" is usually understood in a different way. The focus is on a system's decision-environment, that is, the situational aspects or conditions that influence the system of primary interest but cannot be controlled by it. As they co-produce the system's success or, in the terms of CSH, condition the outcome of systemic rationality, there is an intrinsic interest on the part of those involved to take the thus-understood environment into account. Accordingly it is also called the "relevant environment," meaning that part of the environment which has repercussions on the system. In this sense, then, systems management – the pursuit of systems rationality – includes environmental management, though not necessarily a stance of ecological concern. We are dealing with a managerial understanding of the environment that has little to do with what the concept of the application context intends; in fact it runs counter to it. Those involved vs. those affected In distinction to the relevant environment (E), the context of application (A) comprises all those situational aspects that are affected by "the system" or related claims to systemic rationality but which are not included in the reference system for assessing systems rationality or success. In consequence, the context of application tends to be taken into account – in short, to "count" – systematically only inasmuch as it happens to coincide with S or E, which is the case to the extent the affected parties have ways to influence the way "systems rationality" is defined or to coproduce a corresponding measure of "success." For the rest, S is relevant environment for A rather than the other way round. The methodologically essential focus will therefore be on those situational aspects – concerned parties or interests – that are treated as A only. The crucial boundary issue concerns the delimitation of those affected but not involved from those affected who are also involved (A/S). A graph offered in two previous publications may make this clearer than many words, I reproduce it here for the reader's convenience (Fig. 5). 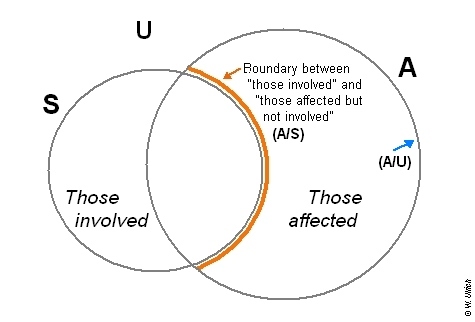 References to "those affected"or simply to "A," unless otherwise specified, will accordingly be understood to focus on the group of those affected but not involved. The context of application vs. the universe Remains the fourth reference system, the universe (U). Apart from being a logically needed residual category, it takes on a specific methodological meaning when it comes to dealing critically with the normative3) content of systems rationality: it refers us to the Kantian principle of moral universalization, better known as Kant's (1786) "categorical imperative." The idea is to question the way we delimit the context of application – the external effects and concerns to be considered – as distinguished from the universe of all other, actual or conceivable, known or unknown external effects, many of which may be beyond closer consideration. Kant's idea was that a subjective norm (or maxim, as he says) of action cannot count as morally arguable and in this sense rational unless all those affected could in principle agree. The difficulty is, how do we know whether they could? Kant invented the categorical imperative as a practical universalization test: it asks us to put ourselves in the place of all those effectively or conceivably concerned and check whether we could then still find the maxim in question to be arguable, and thus generalizable (i.e., a general norm of action rather than just a subjective maxim). In our epoch, Apel (1972) and Habermas (1990) have uncovered the communicative kernel of the categorical imperative and hence have translated it into a model of rational practical discourse, an idea that is beyond adequate discussion in this Postscript but which I have discussed extensively on a number of other occasions (see Ulrich, 2009a-c; 2010a, b; 2011b; 2013; 2015). Suffice it here to note that (U) is a relevant reference system inasmuch as in morally arguable practice, the delimitation of A against U is to be considered no less carefully than all other boundary issues (S/E, E/U, and A/S). (cf. Weber, 1968, esp. p. 24f). Weber's account is complex and need not concern us here in any more detail, the more as interested readers will find my understanding of it explained elsewhere (Ulrich, 2012b, pp. 4-18). For our present purpose it will be quite sufficient to rely on a helpful revision of Weber's typology by Jurgen Habermas (1984, pp. 284-288), a revision that was motivated by the attempt to incorporate the "communicative" side of rational action, along with a shift of perspective from that of an understanding observer (aim: "interpretive social science") to that of a responsible agent (aim: "theory of communicative action"). Like Weber, Habermas starts by distinguishing situations of social from nonsocial action. But he then adds a distinction that matters for identifying the quality of social action, between "consensus-oriented" (or communicative) and "success-oriented" (or noncommunicative) orientation, rather than just distinguishing with Weber between rational and not so rational orientation (the latter distinction is implicit in the proper use of ideal-types). It helps to understand the intent of the additional distinction by recalling Habermas' (1971) earlier, largely parallel distinction between "work" and "interaction" as two fundamental dimensions of practice that go back to Aristotle's concepts of poiesis (work, production) and praxis (action, interaction). Cross-tabulating the two distinctions yields three basic types of rational action, one standing for a "nonsocial" type of rationality and the others for two variants of the "social" type (Table 1). "Instrumental" action represents a type of nonsocial action that is oriented toward what Weber called purpose-rationality, a rationality that is defined by the choice of efficacious means for achieving given ends. As Habermas puts it, it pursues a type of rationality that in its pure form is not oriented towards securing mutual understanding as a value of its own but only towards securing "success" in the limited sense of reaching the end as fully and efficiently as possible. By definition, then, there is no "communicative" variant of nonsocial action and for this reason, the corresponding box in the table remains an empty class. Such a type of rationality, if it existed, would violate Weber's requirement of a recognizable internal "logic" or coherence; in the terms of Habermas, an agent cannot adopt a nonsocial orientation (i.e., prioritize a private utilitarian rather than a communicative and cooperative agenda) yet claim to be oriented towards mutual understanding or "consensus" rather than "success." "Strategic" and "communicative" action, by contrast, both represent types of social action. Since such action may be oriented towards either success or consensus, there are two ideal-types of socially rational action. When oriented primarily to success, social action is interested in the concerns of others only in the opportunistic sense of securing its own success by taking into account their intentions and actions; it represents a "strategic" type of rationality rather than a "communicative" orientation in the full sense of securing mutual understanding and cooperation. This latter orientation is what "communicative rationality" as Habermas understands it is about; the ideal-typical focus is on reaching "consensus" rather than "success" or, to put it differently, its notion of success is oriented towards a type of rational action that is coordinated discursively, by "communicative practice" rather than merely strategic behavior (cf. Habermas, 1984, p. 101). The merit of Habermas' reading of Weber's typology of rational action is that it lends itself to much further reaching critical use. This is so because it overcomes several of the difficulties in Weber's attempt to clarify the meaning of rational action within his framework of interpretive social science, I mean particularly its identification of purpose-rationality with the most rational type of action and its lacking grasp of the social (meaning both intersubjective and societal) dimension of well-understood "rational" practice. As I would argue, Weber's inadequate grasp of what rational social practice means is rooted precisely in his focus on interpretive social science: it caused him to mistake the internal "logic" or coherence of individual action for a major criterion of socially rational action. Such a perspective is meaningful for an interpretive observer, but not for a responsible agent. Weber ended up elevating purpose-rationality to the highest level of his typology of rational action simply because it is the type of rational action that is most easily recognized – or as Weber might put it, the internal logic of which is most easily interpreted – by an objective observer. The result is a fundamental confusion between the rationality of the social scientist's understanding on the one hand and that of the social practice to be understood on the other hand. As the former moves into focus, the latter becomes blurred and ultimately vanishes from sight (see Ulrich, 2012b, p. 19f). Three types of rationality critique Let us see, then, how this basic typology of rational action might be put to critical use within a framework of critical systems thinking and practice. To this end we need to clarify the relations between the three ideal-types of rationality – instrumental, strategic, and communicative – a bit more. How precisely should we understand and handle their basically complementary, yet in practice often conflicting, nature? Is there a way to use them so that together they can ensure rational practice? And hence, do they lend themselves to constructing a practicable, integrated model of rational practice? I propose that a satisfactory answer depends on a transition from Kant's (1786, 1787) two-dimensional concept of reason (theoretical vs. practical reason), which we still recognize in the framework of Habermas (success vs. consensus, work vs. interaction, noncommunicative vs. communicative rationality), to an integrated, hierarchical concept. A multi-level conception of rational practice converts the merely "horizontal" addition of practical reason to theoretical-instrumental reason into a vertically integrated conception, so that practical reason is construed as a higher (or perhaps better, richer) level of rationality that incorporates all lower levels. I have long since used such a framework in my work on critical systems thinking (see esp. Ulrich, 1988, pp. 146-160; 2001b, pp. 79-82; and 2012b, pp. 31-34); but its focus was on integrating the normative dimension of systems rationality into contemporary, science-based and often also one-sidedly technical and/or managerial notions of rationality, rather than on operationalizing boundary critique. In short, the aim was to explain the nature of rational practice, while now it is to explain the reference systems for boundary critique. Here, then, is the latest version of my three-level concept of rational practice (Table 2). Note: This s a postscript to the preceding two-part essay on "Systems thinking as if people mattered" (Ulrich, 2017d, e). It takes up the notion of reference systems for boundary critique and aims to cast a little more light on the different rationalities they embody, by situating them in the author's earlier three-level concept of rational practice (Ulrich, 1988, 2001b, and 2012b). A: What is the relevant context of application or of responsible action? S: What is the system of primary interest or the situation of concern? This new version of the model now explicitly ties the quest for rational practice to systematic boundary critique, which thus becomes an integral requirement of all applied rationality critique. To each of its three levels of systems rationality, the model assigns a conforming type of reference systems, as defined in the S-E-A-U formula of boundary critique. Conversely, the scheme can be understood to work out the different rationality perspectives for which the reference systems stand. The explanation thus works in both ways: rationality perspectives can be explained in terms of boundary critique, and boundary critique in terms of rationality perspectives. A further, essential element of a proper understanding and employment of the model consists in what I propose to call the principle of critically vertical integration of systems levels. Since introducing it requires a bit more space, I will do so in a separate, concluding subsection below. First, I suggest we very briefly consider some of the main theoretical merits of a multi-level conception of rational practice and then illustrate its practical implications – the difference it can make for our understanding of rational practice – by means of two examples. (1) Most basically, the framework puts the three ideal-types of rational action (as summed up in Table 1 and emerging from the sociological tradition of Weber and Habermas) into a compelling yet simple order and thereby clarifies their meaning and mutual relationship. (2) It connects the three Weberian / Habermasian ideal-types of rational action with the two traditions of practical philosophy and of systems theory, and thereby corrects a fundamental deficit of Weber's typology of rational action, it's not being grounded in practical philosophy, along with the missing recognition of the role of boundary critique in Habermas' work. (3) It gives new meaning and practical significance to Kant's two-dimensional conception of reason and thereby to his demand for the primacy of practical reason, thus helping us to breathe new life into practical philosophy and to pragmatize these two basic ideas of it. (4) It enriches the "horizontal" thrust of conventional systems thinking, towards expanding systems boundaries, by a methodologically more fruitful "vertical" perspective of conceptual levels of progressive rationalization of systems (compare on this Feibleman's notion of "integrative levels" as discussed in the concluding section on "vertical integration"). (5) It integrates the communicative turn of our understanding of rationality, as introduced by Karl-Otto Apel (e.g., 1972) and Jurgen Habermas (e.g., 1984), into the practice of rationality critique and thereby paves the way for a critically-normative and discursive concept of rationality, another missing element in the prevalent, scientifically oriented conception of reason. It is obviously the last of these six points that interests us here particularly. Understanding Weber's and Habermas' ideal-types of rational action in the terms of corresponding reference systems for boundary critique is to my knowledge a new idea. More importantly, I see in it the key for developing a conception of critically-normative practice that unlike Habermas' (1979, 1990, 1993) ideal conception of discursive rationality, which ties rational consensus to ideal conditions of practical discourse, is both theoretically convincing and practically achievable. This is so because boundary critique allows critical argumentation on all aspects and implications of claims to rationality, including its normative implications, without depending on conditions of perfect rationality. Quite the contrary, as it does not depend on any particular knowledge or skills that ordinary citizens would not be able to have, boundary critique is apt to promote a new kind of symmetry of critical competence among experts, decision-makers, and citizens so that they can all meet as equals (see Ulrich, 1993 and 2000). Such an understanding of rational practice should make it definitely clear that the three underlying ideal-types of rational action do not embody meaningful alternatives, not any more than Kant's two dimensions of reason do. Rather, they are part and parcel of an integrated concept of levels of systems rationalization, whereby each level is characterized by a specific type of reference system for rationality critique (which in turn is supported boundary critique). Although in actual practice the three levels may of course be developed to varying degrees, it is clear that good practice depends on giving due consideration to all three levels, as each depends for its full rationalization on the other two. Any gains of rationality at the two higher levels must build on the two lower levels, and at the same time, the upper levels must provide orientation to the good use of the lower levels. The scheme thus suggests that the handling of each level is deficient so long as it is not informed and supported by the other two. Consequently, the three rationality perspectives each also lend themselves to critical use with respect to the other two, in addition to their relevance for examining claims at their own level of systems rationalization. Accordingly, the three-level concept of rational practice can also usefully be understood as a framework for applied rationality critique. 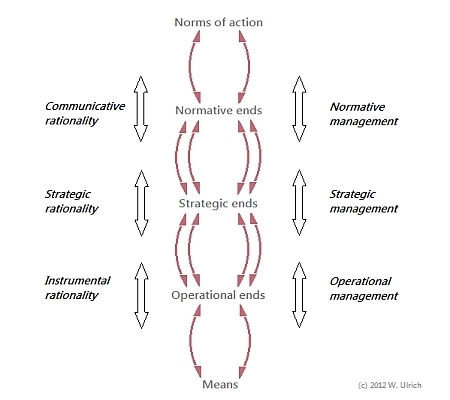 – normative systems management, in which the focus is on the management of conflict (i.e., building up potentials of mutual understanding with all the parties concerned). In short, the three rationality perspectives can be characterized to focus on managerial core issues related to the management of cost, of complexity, and of conflict. To be sure, this is not an entirely new idea. Such multi-level frameworks have been proposed before, for example by Jantsch (1970, 1975), Beer (1972 / 1981), Espejo et al. (1996), and Schwaninger (2001, 2009). However, while these schemes offer a useful extension of the management and planning approaches of the fields in which they were developed, among them technological forecasting and planning, organizational cybernetics, and management theory, they differ from the scheme suggested here in one important respect: they are not grounded in practical philosophy. In the terms of Habermas' typology (Table 1), they remain more or less limited to an orientation towards success (with the "less" applying to Jantsch's framewok, to which we will return below). Accordingly their highest level of systems rationalization remains that of strategic management. They have no means for dealing with the communicative requirements of conflict management that arise when it comes to resolving normative issues, including ethical and moral issues, by means of openly and critically normative argumentation and discourse. In contrast, the three-level concept of rational practice suggested here is grounded in practical philosophy and for this reason can overcome the other schemes' tacit limitation to a merely managerial and strategic notion of rationality that remains tied to an orientation to success. The aim of the present framework reaches further, at what on an earlier occasion I described as vindication beyond mere reference to self-interest, that is, as an understanding of rationality that includes reference to the views and values of parties other than those directly interested and involved – the very core idea of "communicative rationality" (see Ulrich, 2011a, p. 9f). These few remarks must suffice here; for a detailed discussion of the three management levels as understood in the management literature and in my work on critical systems thinking, I may refer the reader to the earlier-mentioned essays (Ulrich, 1988, 2001b, and 2012b). Two application examples To help readers in appreciating the relevance of the proposed three-level framework of rational practice, let us now turn to two major examples of application. I adapt them here from earlier discussions (see Ulrich, esp. 1988 and 2012b). First example: "Stakeholder management" In the seminal text on "stakeholder theory," Freeman (1984, p. 46) defined stakeholders as "any group or individual who can affect or is affected by the achievement of an organization's objectives." A similar, slightly shorter definition defines them as "groups or individuals who can affect, or are affected by, the organization's mission" (p. 52). The definition is widely cited and accepted to this day, yet it is so underspecified that it is hardly useful, in fact, it glosses over the problems it raises. There is no mentioning of the boundary judgments involved, and accordingly no specification of criteria and processes for the boundary critique that would seem required for critical practice (cf. Achterkamp and Vos, 2007). Even worse, the definition glosses over the crucial distinction between stakeholders who are in a position to influence the organization's success or mission and thus the ways it affects them, and others who cannot. In the terms of our earlier Fig. 5, doing justice to stakeholders requires a clear distinction between those involved and those affected but not involved. From a perspective informed by our three-level model of rational practice, it is indeed crucial to carefully distinguish the two groups, as they belong to different reference systems. The first group, inasmuch as it is not identical with those involved in the organization (reference system: S) belongs to the organization's decision-environment (reference system: E), which is that section of the universe which affects the system but is not part of it. The second group, in contrast, comprises all those stakeholders that are or risk being affected without having any influence upon the organization; they are, in the terms of CSH, the group of "those affected but not involved" (reference system: A). As soon as one understands the two stakeholder groups in such terms of boundary critique and related reference systems, it becomes clear that glossing over their different nature in the way Freeman's definition does it is bound to lead into an inadequate treatment of the second group. Its treatment risks being perceived to be of secondary importance as no repercussions are expected for S; it is to S part of the "irrelevant" environment (U) rather than of the "relevant" environment (E). Not surprisingly, then, stakeholder management has achieved little in strengthening corporate social responsibility for all stakeholders, not just for those who are in a position to affect the corporation's success and whose correct treatment is therefore in the very interest of corporate management. This is indeed what has happened, and continues to happen regularly, in the practice of this so-called "stakeholder theory." Mind you, the stakeholders will be ranked regarding their importance according to their "relative power" to affect the organization or its success, not the other way round, according to the severity of the ways in which they may be affected. In the terms of Figures 3 and 4 above, what is taken to "matter" for the organization's response to stakeholder concerns – the way it will treat these concerns – is the relation X–>S rather than S–>X; which is to say, the reference system identifying relevant concerns and rational responses is taken to be E, not A. In everyday terms: thus-understood stakeholder management is motivated by the organization's own interests rather than by the genuine interests and concerns of third parties, particularly if they have little power. One must wonder, then, what should be new in stakeholder theory as compared to previous management theories in its handling of third parties. After all, the reference systems for assessing managerial or organizational "success" and related rationality claims remain the same (S/E). The level of communicative rationality and its normative core thus remain outside the conceptual grasp of stakeholder theory. With its deficient definition of stakeholders, it misses its aim from the start. The underlying concept of rational practice remains tied to the idea of building operational and strategic potentials of success, rather than opening up the universe of discourse to ethical and moral issues of dealing with genuine conflicts of interests and needs, of views and values, whereby all the parties concerned would be treated with equal regard for their concerns, regardless of the influence they have upon the organization. The conclusion is inevitable: due to its being grounded in strategic management but not also in practical philosophy, stakeholder theory fails to do justice to the level of normative management and its requirements of critically-normative discourse. This theoretical deficit need not of course preclude that individual managers of good will may still want to do justice to the concerns of all affected parties; but such a personal stance will not be a systematic part of the systems rationality at work. It does not "count" in the system's measure of success and worse, to the extent that caring about the interests of third parties may involve some cost, such managers of good will even risk being accused of not living up to their full responsibility for the organization's success. From the outset, stakeholder management thus fails to recognize – or take seriously – the conflict of rationalities involved. It knows only one type of rationality, that which serves its own interests. Consequently it also fails to systematically develop the idea that stakeholding might serve a self-critical purpose and might to this end be driven by different rationalities and corresponding action orientations and reference systems. In the terms of our three-level concept of rational practice (cf. Table 2 above), it would indeed make a fundamental difference if corporate managers would approach stakeholders not only with a strategic but also, and primarily, with a communicative concept of rationality in mind. So long as stakeholding relies on an unquestioned strategic concept of rationality, it will deal inadequately with the normative level of management and thereby forsakes much of its potential for improving management practice. Which after all is what stakeholder theory, by advancing a supposed alternative to the classical, economic and managerialist theory of the firm, was meant to achieve in the first place. "Open," in contrast to "closed," systems models consider the social environment of the system; but so long as the system's effectiveness remains the only point of reference, the consideration of environmental factors does nothing to increase the social rationality of a systems design. In fact, if the normative orientation of the system in question is socially irrational, open systems planning will merely add to the socially irrational effects of closed systems planning. For instance, when applied to the planning of private enterprise, the open systems perspective only increases the private (capital-oriented) rationality of the enterprise by expanding its control over the environmental, societal determinants of its economic success, without regard for the social costs that such control may impose upon third parties. Not unlike what has happened in strategic management theory and management education, as illustrated above by the example of so-called stakeholder theory, systems thinking has become seriously impoverished as it has lost sight of the other, non-utilitarian dimension of rationality, a rationality perspective that we have characterized above in terms of social rather than nonsocial orientation (M. Weber), communicative rather than success-oriented rationality (Habermas), or in Kantian terms also as theoretical-instrumental vs. practical-normative reasoning. The two fields of management thought and systems thinking also have in common that they both have been influential, in the past few decades, in shaping our contemporary notions of good and rational practice – so much so that an effective handling of the many pressing problems of our epoch is now almost synonymous with calls for more systemic thinking and for stakeholder management. However, the promise of these two approaches is unlikely to be fulfilled so long as the underlying rationality concepts are impoverished. Accordingly imperative it is that the two-dimensional nature of rationality receive more attention and become an integral part of the "open systems" approach, no less than of stakeholder management. This should happen in a manner that would clarify the mutual relationship of the two dimensions and strike a better balance between them, that is, strengthen the communicative dimension and with it the critically-normative issues that it entails. As long as we merely see in the latter dimension an added consideration that is "nice to have" but, regrettably, often clashes with the need for successful action under pressures of time and money, little will change. Since the two dimensions often clash, it is indeed difficult to think and argue clearly and consistently about what constitutes good and rational practice. Again a Kantian handling of the two dimensions gives us the crucial hint: we can avoid unresolved rationality conflicts between them by bringing them into a vertical order, so that their relationship and ranking become clear and do justice to their nature or to what Kant (1786) calls the primacy of practical reason. In everyday terms we might speak of the means character of theoretical-instrumental reason as related to the selection of ends that must inform it and which in turn is to be guided by practical-normative (including moral) reasoning and corresponding, critically-normative discourse. A multi-level conception of rational practice as proposed in Table 2 offers a relevant, practical framework for such two-dimensional systems thinking, lest it remain a mere ideal. It frees "open" systems thinking from being tacitly and unquestioningly tied to a merely instrumental, success-oriented concept of rationality; a concept of rationality that extends the reference system from S to E but has no grasp of A, and which for this reason also achieves little in the way of bringing into play the level of communicative rationality. The crucial point, as we have well understood by now, is that a mere expansion of systems boundaries from S to E does not at all achieve a change of the rationality perspective at work; for the assumed reference systems for measuring successful and rational action remains the same (S/E). Only the conceptual move to a different reference system, the context of application (A), implies a substantial shift of the rationality perspective at work; which is what the suggested framework achieves with the move to the third level of communicative rationality. Generally speaking, then, reflective practice calls not only for an extension of our horizon of considerations but also for a conscious change of the standpoint from which we seek to extend it. A mere expansion of systems boundaries does not achieve this, as the underlying rationality remains basically the same. Within a framework of conventional systems thinking, chances are that an expanded "systems rationality" (sic) will remain focused on the success of the system of interest. It will thus tend to remain subject to a strategic (i.e., utilitarian) rather than communicative (critically-normative) handling of the social aspects of the situation. The open systems fallacy occurs when our systems thinking aims at an expansion of rationality without being embedded in a reflective and communicative effort of challenging the notions of rationality in play (cf. Ulrich, 1988, p. 156f). Open systems thinking that understands the issue becomes critical systems thinking. Its methodological focus will be on systematically questioning the different reference systems – the sets of boundary judgments, that is – that inform the "facts" and "values" (or the considerations and concerns) taken to be relevant for judging situations and assessing good and rational action. This is of course what CSH's core principle and major tool of boundary critique is all about. By explicitly integrating the concept of boundary critique into the three-level concept of rational practice (an aspect that was still only implicit in the framework's earlier versions of 1988, 2001, and 2012), I hope that both concepts as well as their interdependence have gained in clarity and critically-heuristic power, so that they can support one another in the never ending quest for good and reflective practice. I would like to conclude this discussion on the meaning and use of reference systems in boundary critique with a hint at one more methodological principle that is apt to guide critically-normative practice along the lines suggested in this essay, I call it the principle of critical vertical integration of rationalization levels. I adopt it, once again, from an earlier account (Ulrich, 2012b, pp. 37-39). Final consideration: the principle of critical vertical integration The term "vertical integration" was to my knowledge first used by Erich Jantsch (1969a, p. 54f; 1969b, p. 190f) in the context of technological forecasting and planning. He used it to refer to the integration of all its tasks – "activities" or "functions," as he called them, such as exploring and assessing existent technologies; anticipating and designing technological futures; and defining objectives and policies for the "joint systems of society and technology" (p. 8) – within a systems-theoretically and scientifically based framework of policy sciences, a field emerging in the 1950s and 60s (the seminal publication is Lerner and Lasswell, 1951). Jantsch calls such an integration of forecasting and planning functions "vertical," in distinction to the need for considering, in each stage of technology development, the larger context of the different subsystems involved (man-technology, nature-technology, and society-technology), to which he referred as "horizontal" integration. In a slightly broader perspective, exploring the integration of human design with an evolutionary perspective, Jantsch (1975, pp. 123, 209, 224) also speaks of "vertical centering," in a sense that comes closer to what I mean with the vertical integration of rationality levels. I can best explain my intention by means of a graph that I equally owe to Jantsch (esp. 1975, p. 209). Adapting it to our present aim of grounding the notion of rational practice in practical philosophy rather than in management and planning theory (along with systems thinking), and consequently integrating the level of communicative rationality, we get the following scheme (Fig. 6). The graphic part of the scheme (but not the revised text) betrays its origin in cybernetic thinking and more specifically, in Ozbekhan's (1969, p. 132f) notion of "controlling feedback" loops, according to which "each distinct level of action is controlled by feedback emanating from a different level of the hierarchy" – the idea that provided the inspiration for Jantsch's original graph. In my own understanding of such integrative multi-level thinking, Ozbekhan's and Jantsch's planning levels become levels of rational practice in general. As the previous discussion should also have made clear, I do not follow Ozbekhan and Jantsch in their cybernetic rather than moral and political understanding of "control." The point is not to adapt plans or actions to supposedly objective or natural requirements of the planning "environment" (reference system: E) but rather, to subject them to the views and values of those who may have to live with the consequences (reference system: A) – the communicative dimension of rationality. Accordingly, the different levels of thought are to guide rationality critique (including boundary critique) rather than just managerial control of "turbulent" environments so as to achieve "organizational stability," as a famous concept of the epoch had it (Emery and Trist, 1969, pp. 248-253). The fact that the idea of communicative rationality was not available to Ozbekhan and Jantsch at the time may explain why their frameworks for technological planning and policy "sciences" remain strangely apolitical and do not (or at least, not systematically) take up the ethical and moral questions involved, despite frequent references to values and "normative" forms of planning. Again, the difference is that Ozbekhan and Jantsch did not ground their notion of rational policy-making in practical philosophy but on the contrary, aimed to extend the reach of science into practical-normative territory (compare my discussion, in Ulrich, 2012a, pp. 6-9, of these two opposite approaches to improving practice). Norms of action: highest standards or principles of action (e.g., moral and democratic principles); they shape our values and ideals. Normative ends: standards of improvement defined by personal and institutional values and by related notions of intended consequences; they shape our policies. Strategic ends: objectives defined by policies; they shape our strategies and tactics of action. Means: basic resources defined by available sources of support; they shape the feasibility and efficiency of action. We may then understand our three levels of rational practice to function as communication channels or platforms, as intersections at which different needs and notions of rationalizations meet and can convey meaning and challenges to one another. Such communication across systems levels or, implicitly, across the boundaries of different reference systems, is indispensable with a view to recognition and integration of competing or clashing rationality requirements. We may consequently also capture the idea of a mandatory process of moving up and down the hierarchy by referring to the three rationalization levels as integrative levels, a concept that to my knowledge Feiblemann (1954) was first to explain systematically, although still in a context of mainly functional thinking (e.g., in biology and ecology). In the present context I understand integrative levels as conceptual levels of rationality that gain their full meaning and validity only in the light of a combined, or "integrative," multi-level perspective. The practical way to implement this idea is by an iterative process of vertical centering: each level is at regular intervals (iteratively rather than permanently) to be in the center of systematic review both from above and from below. This way of visualizing and describing the idea of vertical integration should also remind us that each of the three concepts of rationality has to play a critical role with respect to the other two. Each level is to help us "discipline" the claims to rationality of the others, as it were. Vertical integration is first of all rationality critique. It is a principle of reflective practice. It understands rational action as the result of a self-reflecting and communicative process of rigorous scrutiny of its assumptions and implications across the three levels of rationalization. Speaking of vertical integration is thus really just a convenient short formula for what is more precisely called the principle of critical vertical integration. To be sure, vertical integration is not meant to replace horizontal integration but rather to give it a new depth, so to speak. Rationality critique has both a horizontal and a vertical dimension; both matter in boundary critique. A well-understood "open systems" perspective will henceforth question our reference systems, and unfold their implications, in both horizontal and vertical direction. Horizontally, it will enlarge our view of situations by expanding the reference systems considered; vertically, it will deepen our understanding of situations by shifting our standpoint and perspective between essentially different reference systems. The three-level concept of rational practice thus translates into a process of systematic rationality review. In a deliberate reversal of my earlier-quoted critical comment on the open systems fallacy, systems rationality will then no longer focus exclusively on the "problems of the system" but will instead consider "the system" and the boundary judgments constitutive of it as a core problem of any understanding of "rational" practice. We've come full circle, back to what Robert Pirsig, in the quote from Zen or the Art of Motorcycle Maintenance that serves as a motto for this essay, described as a key confusion of our time: "The true system," he wrote, "the real system, is our present construction of systematic thought itself, rationality itself.… There's so much talk about the system. And so little understanding." (Pirsig, 1975, p. 94) Would it be all too presumptuous to hope that we may have lessened this lack of understanding just a little bit? Achterkamp, M.C, and Vos, J.F.J. (2007). Critically identifying stakeholders: evaluating boundary critique as a vehicle for stakeholder identification. Systems Research and Beahvioral Science, 24, No. 1, pp. 3-14. Apel, K.O. (1972). The a priori of communication and the foundation of the humanities. Man and World, 5, pp. 3-37. Ayer, A.J. (1936). Language Truth, and Logic. London: Victor Gollantz (2nd edn. New York: Dover Publications, 1952). Beck, U. (1992). Risk Society: Towards a New Modernity. London, UK, and Thousand Oaks, CA: Sage (German orig. 1986). Beck, U. (1995). Ecological Politics in an Age of Risk. Cambridge, UK: Polity Press (German orig. 1988). Beer, S. (1972/1981). Brain of the Firm: The Managerial Cybernetics of Organizations. 2nd. ed., Chichester, UK: Wiley (orig. 1972). Carnap, R. (1937). The Logical Syntax of Language. New York: Hartcourt, Brace (German orig. 1934). Churchman, C.W. (1982). An appreciation of Edgar Arthur Singer, Jr. In C.W. Churchman, ed., Thought and Wisdom. Seaside, CA: Intersystems, pp. 116-135..
Emery, F.E., and Trist, E.L. (1969). The causal texture of organizational environments. In F.E. Emery (ed. ), SystemsThinking, Harmondsworth, UK: Penguin, 1969, pp. 241-257 (orig. in Human Relations, 18, 1965, pp. 21-32). Espejo, R., Schuhmann, W., Schwaninger, M., and Bilello, U. (1996). Organizational Transformation and Learning:A Cybernetic Approach to Management. Chichester, UK: Wiley. Feiblemann, J.K. (1954). Theory of integrative levels. British Journal for the Philosophy of Science, 5, No. 17, pp. 59-66. Freeman, R.E. (1984). Strategic Management: A Stakeholder Approach. New York: Cambridge University Press. Funtowicz, S.O., and Ravetz, J.R. (1993). Science for the post-normal age. Futures, 25, No. 7 [Sept 1993], pp. 739-755. Funtowicz, S.O., and Ravetz, J.R. (1995). Science for the post normal age. In L. Westra L. and J. Lemons (eds. ), Perspectives on Ecological Integrity, Dordrecht, Netherlands: Springer, pp. 146-161. Gibbons, M., Limoges, C., Nowotny, H., Schwartzman, S., Scott, P., and Trow, M. (1994). The New Production of Knowledge: The Dynamics of Science and Research in Contemporary Societies. London: Sage. Habermas, J. (1979). Communication and the Evolution of Society, Boston, MA: Beacon Press. Habermas, J. (1984). The Theory of Communicative Action. Vol. 1: Reason and the Rationalization of Society. Cambridge, UK: Polity Press. Habermas, J. (1990). Moral Consciousness and Communicative Action. Cambridge, UK: Polity Press (orig. : Moralbewusstsein und kommunikatives Handeln, Frankfurt am Main: Suhrkamp, 1983). Habermas, J. (1993). Justification and Application: Remarks on Discourse Ethics. Cambridge, UK: Polity Press. Jantsch, E. (1969a). Integrative Planning for the "Joint Systems" of Society and Technology – The Emerging Role of the University. [Report to] Massachusetts Institute of Technology, Alfred P. Sloan School of Management, Cambridge, MA (Mimeographed copy, May 1969). Jantsch, E. (1969b). Integrative planning of technology. In E. Jantsch (ed. ), Perspectives of Planning. Proceedings of the OECD Working Symposium on Long-Range Forecasting and Planning, Bellagio, Italy, 27 Oct-2 Nov 1969. Paris: OECD / Washington, DC: OECD Publications Center, 1969, pp. 179-200. Jantsch, E. (1970). From forecasting and planning to policy sciences. Policy Sciences, 1, No. 1, pp. 31-47. Kant, I. (1786). Groundwork of the Metaphysic of Morals. 2nd ed. (1st ed. 1785). Transl. by H.J. Paton. New York: Harper Torchbooks, 1964. Kant, I. (1787). Critique of Pure Reason. 2nd ed. (1st ed. 1781). Transl. by N.K. Smith. New York: St. Martin's Press, 1965 (orig. London and New York: Macmillan 1929). Lerner, D., and Lasswell, H.D. (eds.) (1951). The Policy Sciences: Recent Developments in Scope and Method. Stanford, CA: Stanford University Press. Ozbekhan, H. (1969). Toward a general theory of planning. In E. Jantsch (ed. ), Perspectives of Planning. Proceedings of the OECD Working Symposium on Long-Range Forecasting and Planning, Bellagio, Italy, 27 Oct-2 Nov 1969. Paris: OECD/ Washington, DC: OECD Publications Center, 1969, pp. 47-155. Pirsig, R.M. (1975). Zen or the Art of Motorcycle Maintenance. New York: Bantam Books (orig. New York: Williams Marrow, 1974). Popper, K.R. (1959). The Logic of Scientific Discovery. London: Hutchinson. New edn. London: Routledge, 2002 (German orig. 1935). Popper, K.R. (1963). Conjectures and Refutations: The Growth of Scientific Knowledge. London: Routledge & Kegan Paul. Popper, K.R. (1972). Objective Knowledge: An Evolutionary Approach. Oxford, UK: Clarendon Press. Reichenbach, H. (1938). Experience and Prediction: An Analysis of the Foundations and the Structure of Knowledge. Chicago, IL: University of Chicago Press. Schwaninger, M. (2001). Intelligent organizations: an integrative framework. Systems Research and Behavioral Science, 18, No. 2, pp. 137-158. Schwaninger, M. (2009). Intelligent Organizations: Powerful Models for Systemic Management. 2nd ed., Berlin: Springer (1st ed. 2006, German orig. 1999). Singer, E.A. Jr. (1957). Experience and Reflection (C.W. Churchman, ed.). Philadelphia, PA: University of Pennsylvania Press. Thompson, J.L. (1997). Strategic Management: Awareness and Change. 3rd edn. London and Boston MA: International Tomson Business Press (orig. 1990; 6th edn. 2010). Ulrich, W. (1975). Kreativitätsförderung in der Unternehmung: Ansatzpunkte eines Gesamtkonzepts. Bern, Switzerland: Haupt. Ulrich, W. (1983). Critical Heuristics of Social Planning: A New Approach to Practical Philosophy. Bern, Switzerland, and Stuttgart, Germany: Paul Haupt. Pb. reprint edn., Chichester, UK, and New York: Wiley, 1994 (same pagination). Ulrich, W. (1984). Management oder die Kunst, Entscheidungen zu treffen, die andere betreffen. Die Unternehmung, Schweizerische Zeitschrift für betriebswirtschaftliche Forschung und Praxis / Swiss Journal of Business Research and Practice, 38, No. 4, pp. 326-346. Ulrich, W. (1987). Critical heuristics of social systems design. European Journal of Operational Research, 31, No. 3, pp. 276-283. Reprinted in M.C. Jackson, P.A. Keys and S.A. Cropper, eds., Operational Research and the Social Sciences, New York: Plenum Press, 1989, pp. 79-87, and in R.L. Flood and M.C. Jackson, eds., Critical Systems Thinking: Directed Readings, Chichester, UK, and New York: Wiley, 1991, pp. 103-115. Ulrich, W. (1988). Systems thinking, systems practice, and practical philosophy: a program of research. Systems Practice, 1, No. 2, pp. 137-163. Reprinted in R.L. Flood and M.C. Jackson, eds., Critical Systems Thinking: Directed Readings, Chichester, UK, and New York: Wiley, 1991, pp. 245-268. Ulrich, W. (1993). Some difficulties of ecological thinking, considered from a critical systems perspective: a plea for critical holism. Systems Practice, 6, No. 6, pp. 583-611. Ulrich, W. (1996). A Primer to Critical Systems Heuristics for Action Researchers. Centre for Systems Studies, University of Hull, Hull, England, 31 March 1996. Ulrich, W. (1998). Systems Thinking as if People Mattered: Critical Systems Thinking for Citizens and Managers. Working Paper No. 23, Lincoln School of Management, University of Lincolnshire & Humberside (now University of Lincoln), Lincoln, UK, June 1998. Ulrich, W. (2000). Reflective practice in the civil society: the contribution of critically systemic thinking. Reflective Practice, 1, No. 2, pp. 247-268. Ulrich, W. (2001a). The quest for competence in systemic research and practice. Systems Research and Behavioral Science, 18, No. 1, pp. 3-28. Ulrich, W. (2001b). A philosophical staircase for information systems definition, design, and development (A discursive approach to reflective practice in ISD, Part 1). Journal of Information Technology Theory and Application, 3, No. 3, 2001, pp. 55-84. Ulrich, W. (2003). Beyond methodology choice: critical systems thinking as critically systemic discourse. Journal of the Operational Research Society, 54, No. 4, pp. 325-342. Ulrich, W. (2004). Obituary: C. West Churchman, 1913-2004. Journal of the Operational Society, 55, No. 11, pp. 1123-1129. Ulrich, W. (2006a). Critical pragmatism: a new approach to professional and business ethics. Interdisciplinary Yearbook of Business Ethics, Vol. 1, ed. by L Zsolnai. Oxford, UK, and Bern, Switzerland: Peter Lang, pp. 53-85. Ulrich, W. (2006b). Rethinking critically reflective research practice: beyond Popper's critical rationalism. Journal of Research Practice, 2, No. 2, 2006, Article P1. Ulrich, W. (2007). Philosophy for professionals: towards critical pragmatism. Journal of the Operational Research Society, 58, No. 8, 2007, pp. 1109-1113. Rev. postpublication version in Ulrich's Bimonthly, March-April 2016 (Reflections on Critical Pragmatism, Part 7). Ulrich, W. (2009b) Reflections on reflective practice (6a/7): Communicative rationality and formal pragmatics – Habermas 1. Ulrich's Bimonthly, September-October 2009. Ulrich, W. (2009c). Reflections on reflective practice (6b/7): Argumentation theory and practical discourse – Habermas 2. Ulrich's Bimonthly, November-December 2009. Ulrich, W. (2010a). Exploring discourse ethics (1/2). Ulrich's Bimonthly, March-April 2010. Ulrich, W. (2010b). Exploring discourse ethics (2/2). Ulrich's Bimonthly, May-June 2010. Ulrich, W. (2011a). What is good professional practice? (Part 2: The quest for practical reason). Ulrich's Bimonthly, May-June 2011. Ulrich, W. (2012a). Research, practice, and research practice. Ulrich's Bimonthly, March-April 2012 (18 February 2012). Ulrich, W. (2012b). What is good professional practice? Part 3: The quest for rational action. Ulrich's Bimonthly, May-June 2012 (1 May 2012). Ulrich, W. (2012c). CST's two ways: a concise account of critical systems thinking. Ulrich's Bimonthly, November-December 2012. Ulrich, W. (2017a). The concept of systemic triangulation: its intent and imagery. Ulrich's Bimonthly, March-April 2017. Ulrich, W. (2017b). If systems thinking is the answer, what is the question? Discussions on research competence (Part 1/2). Ulrich's Bimonthy, May-June 2017. Ulrich, W. (2017c). If systems thinking is the answer, what is the question? Discussions on research competence (Part 2/2). Ulrich's Bimonthy, July-August 2017. Ulrich, W. (2017d). Systems thinking as if people mattered. Part 1: A plea for boundary critique. Ulrich's Bimonthly, September-October 2017. Ulrich, W. (2017e). Systems thinking as if people mattered. Part 2: Practicing boundary critique. Ulrich's Bimonthly, November-December 2017. Weber, M. (1968). Economy and Society: An Outline of Interpretive Sociology. Ed. by G. Roth and G. Wittich. New York: Bedminster Press (German orig. 1922; the transl. is based on the 4th ed. 1956). 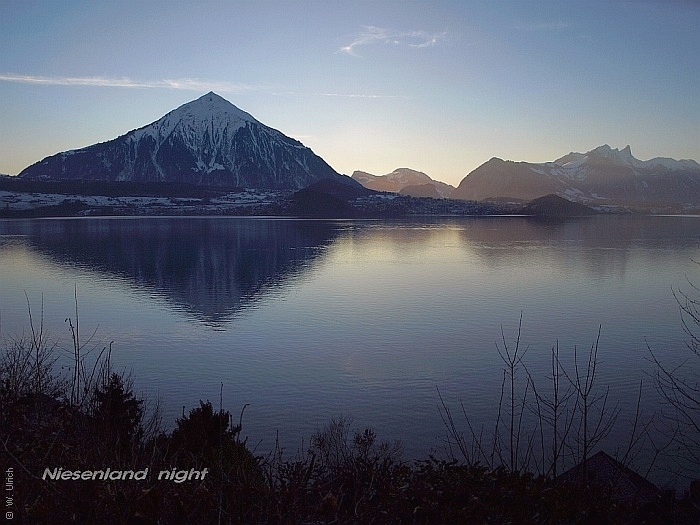 Picture data Digital photograph taken on 18 January 2010, around 4:30 p.m., above Lake Thun, Switzerland. ISO 100, exposure mode aperture priority with aperture f/3.5 and exposure time 1/1200 seconds, exposure bias -0.30. Metering mode multi-segment, contrast soft, high, sharpness soft. Focal length 14 mm (equivalent to 28 mm with a conventional 35 mm camera. Original resolution 3648 × 2736 pixels; current resolution 700 x 525 pixels, compressed to 153 KB. Write down your thoughts before you forget them! Just be sure to copy them elsewhere before leaving this page.